Dr. Pulapaka, a native of India, owns a wildly successful restaurant in downtown DeLand called Cress. Hari Pulapaka, a native of Mumbai, India, came to the U.S. for graduate studies in 1987. He has been at Stetson University since the fall of 2000. Pulapaka is interested in all areas of mathematics and is always looking for new sources of problems for undergraduate research. 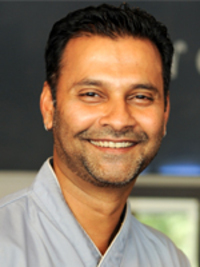 Hari is also a classically trained chef and is interested in all areas of gastronomy. When not teaching or working on mathematics and related areas, he is at Cress, a restaurant in downtown DeLand that he owns with his wife, working as an active professional chef. Hari Pulapaka and David R. Gibson, "An Efficient Algorithm for Chemical Fingerprinting," Journal of Mathematical Chemistry, Volume 44, Issue 1, 2008, pp. 75-87. Hari Pulapaka, "On Generalized Galileo Sequences,"Missouri Journal of Mathematics, Volume 20, Number 3, 2008, pp. 178-185. Hari Pulapaka, "Non-revisiting Cycles on Surfaces," Discrete Mathematics, Volume 207, Number 1-3, 1999, pp. 219-231. Hari Pulapaka and Andrew Vince, "Non-Revisiting Paths on Surfaces with Low Genus," Discrete Mathematics, Volume 182, Number 1-3, 1998, pp. 267-277. Hari Pulapaka and Andrew Vince, "Non-Revisiting Paths on Surfaces," Discrete and Computational Geometry, Volume 15, 1996, pp. 353-357.